15 years ago, long before the Guitar Hero and Rock Band franchises really took off and brought the music game genre to the gaming mainstream, when everyone thought of music games, people brought up games like Dance Dance Revolution and its ilk, such as Bust a Groove, one of my personal favorites, back then, and Parappa the Rapper. Harmonix’s Frequency gave us the same kind of game presented in a different way: you had a catalogue of American artists from across many genres, you were presented a kind of shoot-’em-up rail shooter approach to following along with music, you were given the ability to freestyle remix your song at certain points.What you saw were the foundations of what turned Guitar Hero into the hit franchise it still is, today. I was on the line with this series – with Frequency and Amplitude on the PlayStation 2 – for the unique approach and music selection. Most of the music games I went for, those days, were heavy with underground EDM and J-POP hits that I couldn’t always get into and Frequency hit a nerve with me because it had more of the kinds of artists I know I’d get into. It’s actually responsible, single-handedly, for my love for the band Fear Factory, if that gives you an idea of how much I liked the soundtrack. Fast forward until 2014 where Harmonix starts a Kickstarter fundraiser for a new title and while it didn’t attract the attention some other Kickstarter video game projects get, these days, it still got some big name support from names like Greg Miller and others in the gaming press. 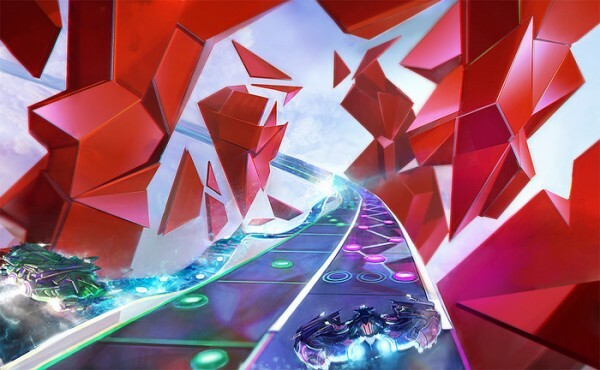 Everybody, thanks to the approach of the project, who backed the project had a good idea of what to expect from the newest entry in the series, titled like the second entry: Amplitude. This game offered, more or less, the same game as others in the series but introducing some new gameplay elements, a new soundtrack, and some more straightforward approaches to the campaign. Follow the jump for more! If you’ve played any of the other games in the series you pretty much know what to expect. If not, let me give you a little breakdown of what to expect: picture the Guitar Hero approach of a narrow path where your job is to hit little note indicators in time with the music but unlike Guitar Hero and Rock Band where each player is responsible for a single instrument, as a player in Amplitude, you’re responsible for the entire composition, which could be six or more total tracks and you get judged based on sections of each track and you’re required to traverse all tracks and keep your eyes everywhere at all times. 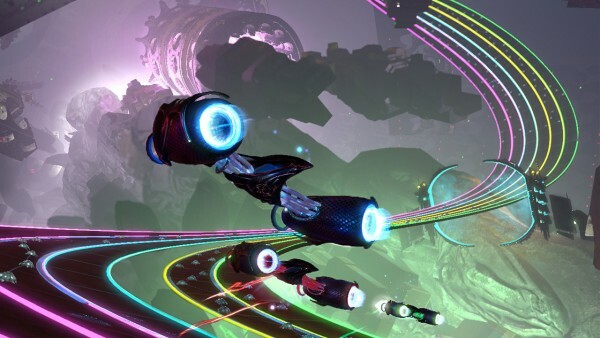 If you’re the type that likes the idea behind games like Guitar Hero but don’t like the fake instruments and would like an additional challenge then Amplitude is for you. You have to keep your focus everywhere you can, at all times. However, if you’ve played any of the games previous to this one in the series and you’re bored of the gameplay, this game probably isn’t for you as not much has changed, really. There isn’t much of a campaign and the multiplayer is strictly local for the time being – or, at least, as far as I could tell – and the initial tutorial and campaign seems to exist only to unlock and acquaint you with the controls, power-ups, and general feel of the game, which is fine by me. There’s enough here to keep you occupied, especially if you’re like me and you would need a great deal of practice to get into the advanced difficulty levels. No music-based game is worth their weight in gold and, keeping that analogy in mind, this game isn’t very heavy; unlike games in the series’ past, the soundtrack in this game, as of yet, is extremely EDM heavy, sporting some nice drum and bass and dubstep tracks alongside some pretty neat orchestral-flavored tracks. There was some heavy mainstream influence in the other games, much like their Guitar Hero games, but it would seem that it’s a tad disappointing not to see a little more variety in the game’s music but it makes sense, given that this game was a Kickstarter project, so it wouldn’t have the same licensing budget that games in the series’ past had. That might change, though, with the advent of possible DLC, so I’m kind of crossing my fingers that Harmonix puts a lot of time and heart into expanding the gameplay and soundtrack like they have done to almost all of their games. While it’s disappointing that there aren’t more mainstream hits across more genres I can’t eliminate the possibility of additions and I certainly hope there will be additions as this game would be a disappointing step down from other games in the series. 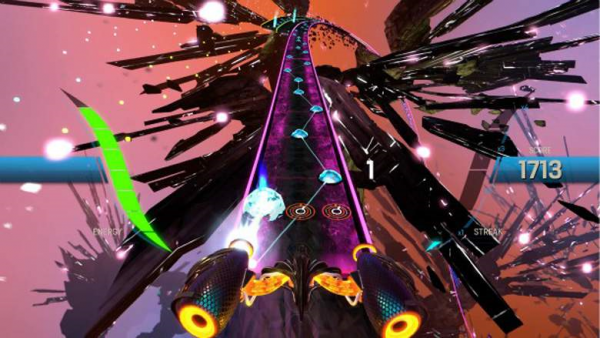 There’s enough here to renew interest in Amplitude and there’s enough here to bring in new fans to the genre who are looking for a change of pace to the Rock Band and Guitar Hero franchises but there isn’t nearly enough here to keep that interest going for a long time, especially for new fans. I blew through campaigns for the first two difficulty levels in one sitting and I’m leisurely going through the rest of the extra songs casually. If Harmonix wants to turn this game into another cherished music game franchise like Guitar Hero, it needs to seriously consider expanding this platform and start adding in features and music selections, pronto. There’s so much potential here that this could be a mind-bendingly awesome game with only a few vital, important changes such as online multiplayer, regularly added music, options to play songs from earlier games, and the ability to change up not just the look of the ship you use but perhaps the backgrounds, tracks, and presentation as a whole, just to name a few. The latter could be based on a points system where the points you earn per track are accumulated and can be used to buy these items so it gives the player incentive to unlock it all. Harmonix needs to get on top of this game before it flops. I’m excited for the potential of this game and I’ll likely enjoy this game casually but to earn more than that, from me, they’re going to have to bring a lot more to the plate.